The minimum requirement for 17- to 21-year-old males is 35 pushups, 47 situps and a two-mile run in 16 minutes, 36 seconds or less. For females of the same age, the minimum requirement is 13 pushups, 47 situps and a 19:42 two-mile run. Why the difference in fitness requirements? 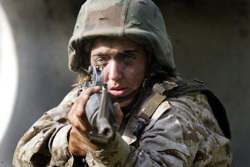 “USMC Women in the Service Restrictions Review” found that women, on average, have 20 percent lower aerobic power, 40 percent lower muscle strength, 47 percent less lifting strength and 26 percent slower marching speed than men. In a January report titled “Defense Department ‘Diversity’ Push for Women in Land Combat” Elaine Donnelly, director of the Center for Military Readiness, points to U.S. Army studies showing that women are twice as likely to suffer injuries and are three times more undeployable than men. Women are less likely to be able to march under load — 12.4 miles in five hours with an 83-pound assault load — and to be able to crawl, sprint, negotiate obstacles with that load or move a casualty weighing 165 pounds or more while carrying that load. Plus, there are muscle-challenging feats, even for men, such as field repairs on an M1A1 Abrams tank. Posted at Townhall.com on February 6, 2013. Reprinted here February 14, 2013 for educational purposes only. For a brief bio and more articles by Walter Williams, go to: econfaculty.gmu.edu/wew/vita.html. 2. Do you think the facts provided by Dr. Williams strongly support his reason for opposing women in combat? Explain your answer.